Our bodies work in mysterious ways. While we're not in a position to diagnose ourselves with medical conditions, we can definitely see early signs of physical problems in several specific parts of our body. Take signs shown on our tongues and on our skin, for example. Many of these bodily signs can point to a significant nutritional deficiency, and need to be checked out by a physician immediately. In an exclusive look below, we explore some of the most noted abnormalities on perhaps the most telling part of our bodies: our fingernails. Consulting research from medical database WebMD and Jenny Hills, a professional writer and researcher specializing in alternative medicine and natural remedies, we look at what signs are harmless, and which can indicate problematic and fatal conditions. Because there are several possible explanations for each abnormality, it's always best to consult your doctor to see the appropriate steps that you need to take. But for now, scroll further to read about each different nail, and let us know your thoughts about these health warnings in the comments below! 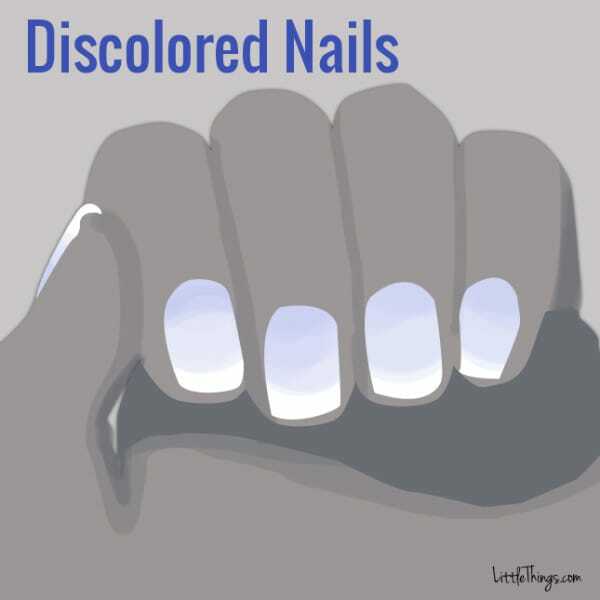 Discolored nails can indicate various things, including signs of an infection, a nutritional deficiency, and a problem with one of your organs. You can easily get yellowish nails, for example, by using lots of nail polish over a long period of time. But it can also point to a fungal nail infection, or even psoriasis, says Hills. Brown nails can indicate a thyroid disease or malnutrition; white nails can point to an iron deficiency; and strangest of all, nails with a bluish-gray tint can mean that your body might not be getting enough oxygen. According to WebMD, this color could also point to an issue with your lungs or heart. According to WebMD, dry, brittle nails that frequently split or crack have been linked to things like thyroid disease and fungal infections. But they can also indicate lichen planus, a condition that results in itchy rashes on the skin or around the mouth. 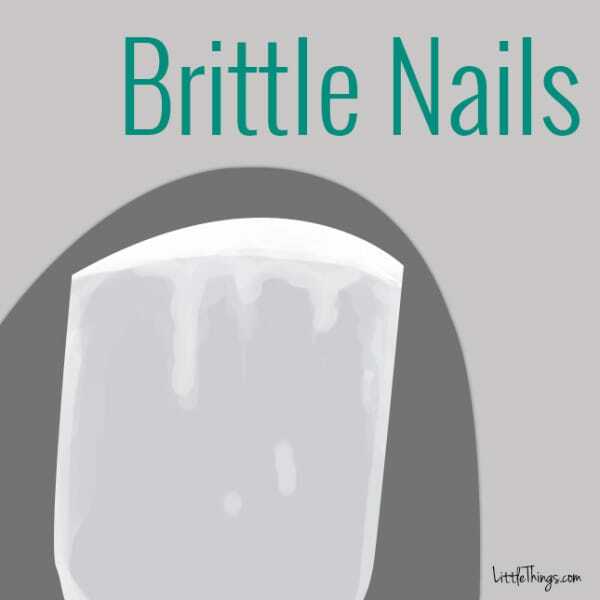 Of course, brittle nails can also be the result of aging, or a longtime exposure to chemicals in nail polish and laundry detergents, according to Hills. Again, here's another nail condition that may be caused by a fungal infection. 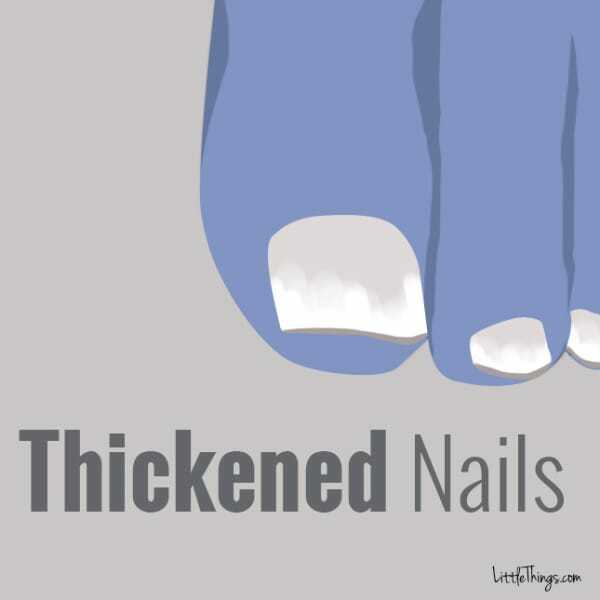 Among many other possible causes, thickened nails can form due to reactive arthritis (a really painful kind of inflammatory arthritis) and lung diseases. However, yellowish, slow-growing, and thickened nails can also come about when there's a longstanding injury, or if you have skin conditions like eczema and psoriasis. According to MD-Health, these conditions can greatly irritate dead skin cells around the finger or toenails, which, if left unchecked or untreated, can result in painful, thickened nails. Another possible explanation is poor circulation. Medical conditions, like diabetes, can slow down the blood flow through the fingers and toes, and affect the quality of the skin. 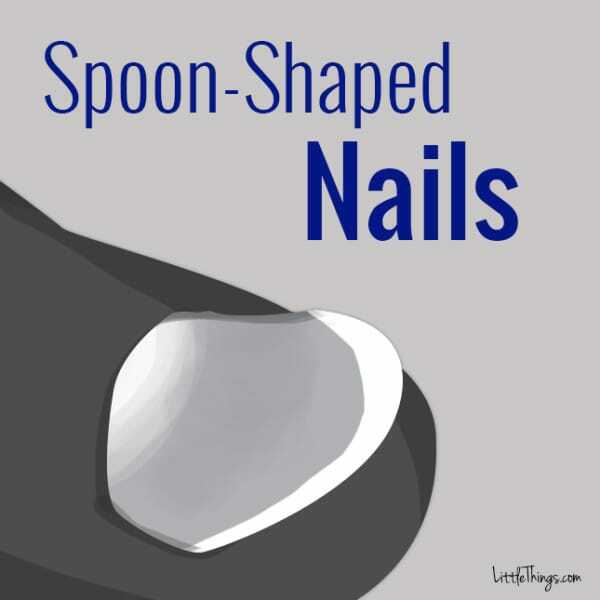 Spoon-shaped fingernails curve inward, and look like they are "scooping" outward. They can indicate a condition known as koilonychia, a disease that can be an indicator of hypochromic anemia, which leaves the red blood cells paler than normal. In addition, these nails can be a sign of hemachromatosis, a liver condition that is caused by a surplus of iron. They can also be a sign of heart disease or hypothyroidism. If you spot little pits or small depressions in your nails, there's no immediate reason to be alarmed. According to ZocDoc, this may be a genetic occurrence, rather than a medical condition. 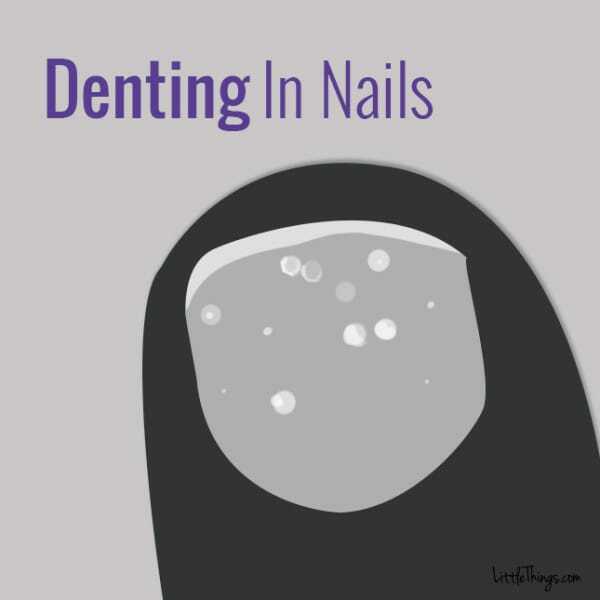 However, medical conditions such as psoriasis and reactive arthritis may also likely be the reason that you're seeing little dents in your nails. Other possibilities include eczema and alopecia areata, a genetic disease that results in spot baldness. Also dubbed "Beau's lines," these horizontal grooves are ridges and indentations in the nails. There are several causes, including malfunctions during cell division, infections in the nail fold, or finger injuries. They're also believed to form as a result of nutritional deficiencies, chemotherapy, diabetes, and prolonged exposure to extreme temperatures. 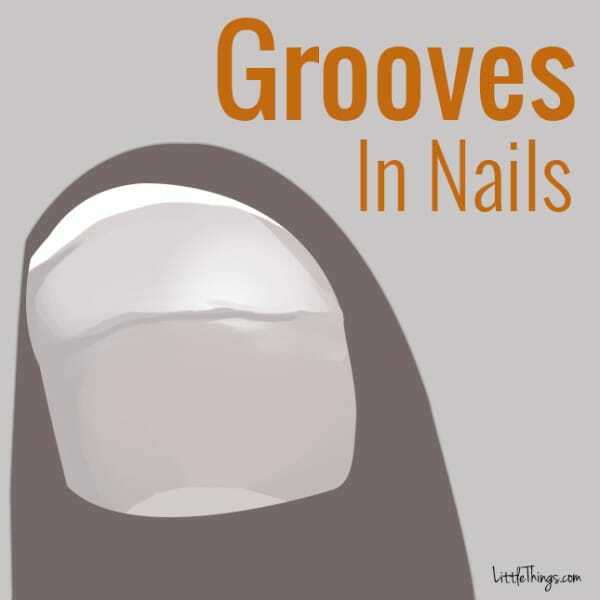 Also known as drumstick fingers and watch-glass nails, clubbed nails occur when the nails curve around the fingertips. This could be totally harmless — there might be an increased blood flow to the fingertips, and this could even be a genetic occurrence. However, if you suddenly observe that your nail beds are beginning to soften and fluctuate in size, this might mean you're experiencing low oxygen levels in your blood. 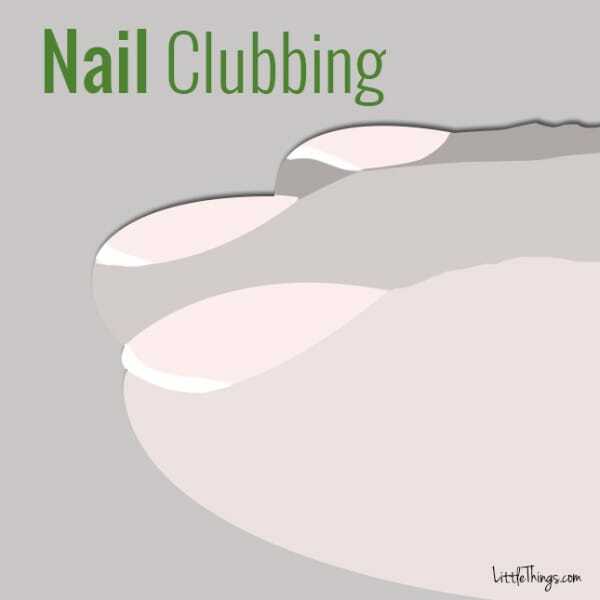 Clubbed nails could also indicate lung and liver disease, heart disease, and inflammatory bowel disease, according to Hills. 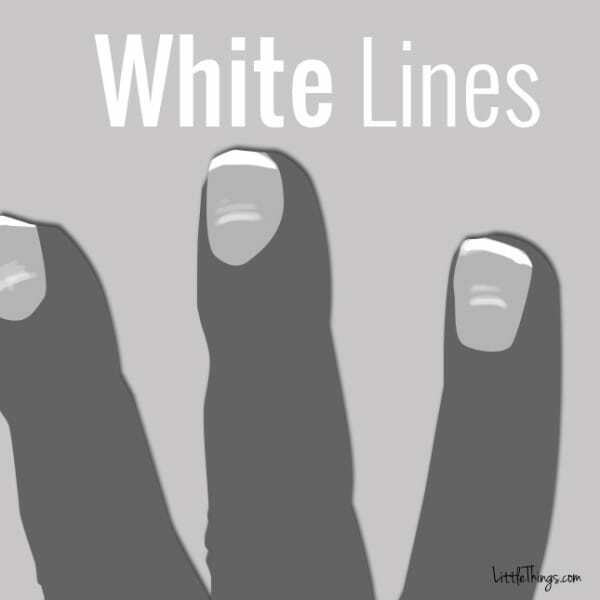 Also dubbed "Muehrcke's lines," these double white lines run horizontally across the nails, and are typically most clearly seen on the index, middle, and ring fingers. These lines are actually situated in the vascular nail bed, so they don't grow simultaneously with the nails. Commonly, these lines can indicate low levels of protein in the blood, which can be caused by liver disease or malnutrition, or during periods of stress, especially ones that affect your metabolism, according to WebMD. 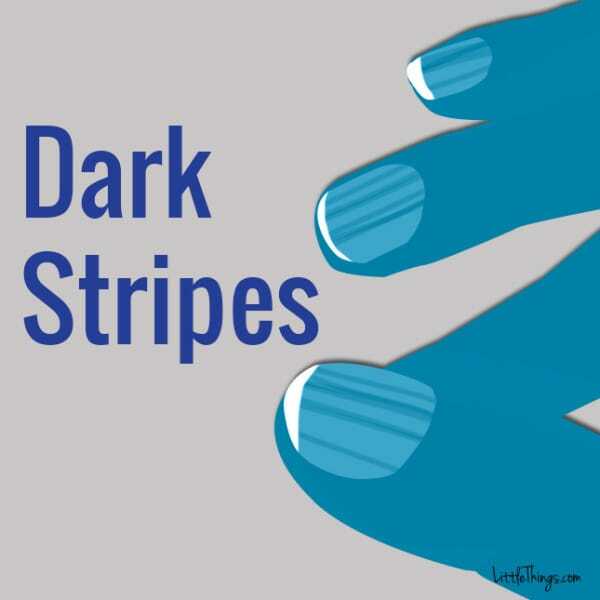 In many cases, these dark, vertical stripes across your nails are harmless. 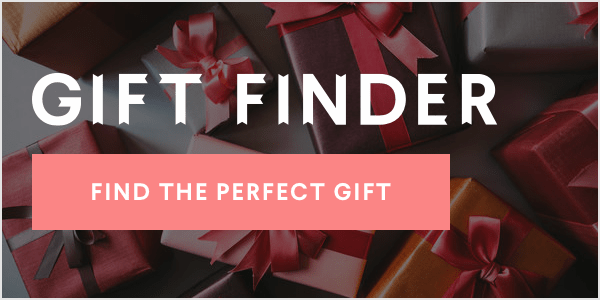 However, there is a chance that they could be a sign of subungual melanoma, an extremely ferocious form of cancer that occurs on the toes or fingers. In general, this type of melanoma only affects one nail at a time, and will also cause significant changes in the color of the stripes on the nail surface, according to the English National Health Service. If you notice a change in the pigmentation in the nail folds, or the appearance of such dark stripes, consult a doctor immediately. 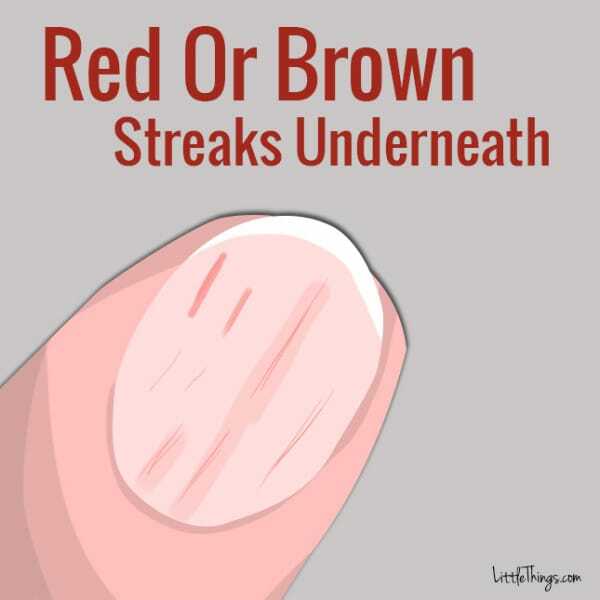 Also called splinter hemorrhages, these thin, reddish brown streaks underneath the nails are primarily tiny, damaged blood vessels. They're usually nothing to worry about, and are typically caused by tiny clots or damaged capillaries underneath the nails, according to MedlinePlus. However, they can indicate wider, more severe causes that have to do with inflammation or swelling, including medical conditions like rheumatoid arthritis and psoriasis. Will you be monitoring your own nails more closely from now on? Please SHARE these potentially lifesaving tips with family and friends!